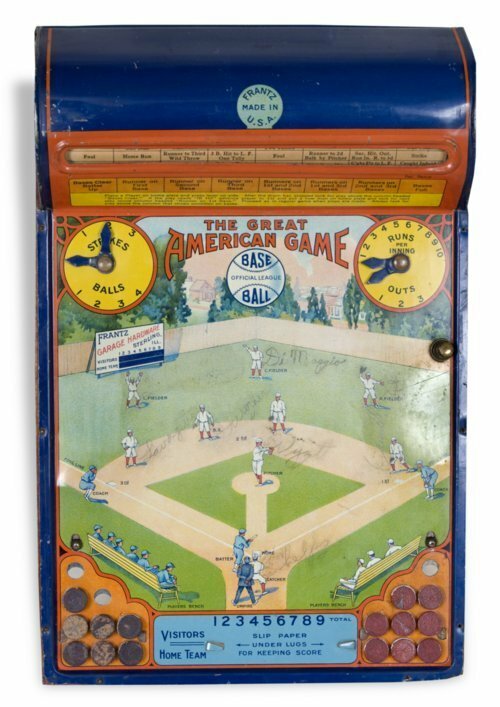 A mechanical baseball game produced in the 1920's. The game is composed of a metal lithograph scene of a baseball game on a stained wooden frame. In pencil a previous owner wrote the names of players such as Lavagetto, Durocher, DiMaggio, Wyatt, and Phelps. The Frantz Company, a garage hardware manufacturer, produced this baseball game as well as a very similar football game. The Company was founded in Sterling, Illinois in 1907 and, into the present day, has been producing various inventions composed of metal, wood, and other materials. The toys produced by the Frantz Company were often sold in major department stores around the country.